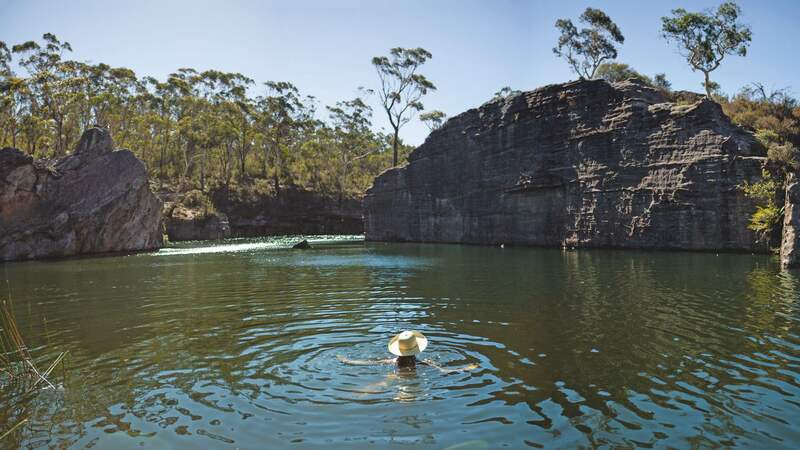 The authors of 'Places We Swim' pick five all-time swimming spots that every Australian water lover should visit. It's no secret we love a swimming hole. From Sydney to Melbourne to Brisbane and even over to Perth, we spend our spare January days driving in search of a swimmable body of water, and the other seasons eagerly awaiting the ripeness of summer. And the best part is that this country is full of swimming spots unique to our sunburnt landscape, both on rugged coast and hidden in-land among bush and desert rocks. Caroline Clements and Dillion Seitchick-Reardon visited a whole heap of them as 'research' for their new book, Places We Swim. While the book collates handy information about 60 pools, lakes, beaches and gorges across the country, here, they detail five of the stunning spots that you should most definitely plan a road trip around before summer ends. Dressed in native gumtrees, the landscape here feels like true blue Australiana. Around Christmas time, the tea-tree near the waterline turns white, like it's somehow snow-covered in the middle of summer. The reserve is home to two disused railway dams (that feel like lakes) built to supply water for steam engines, and is still bordered at the north side by a functioning western railway corridor. But the Crown Land area is now used mostly for public recreation such as bushwalking, rock climbing, canyoning and swimming. Swimmers are in for a treat. Huge pieces of ironstone protrude out of the water in soft shapes of all sizes, like artful, abstract sculptures. It's not the water that makes this swimming hole great, it's the rock. Some have an architectural quality, which starts to make a lot of sense when we remember we were brought here by an architect. The water is cool and deep, and we swim from a low entry point over to a large ten-metre-high wall. The drop is sheer; it's also a rite of passage for local teenagers. We're about 20 years older than most, but we take the deep plunge into the cool freshwater below, slapping the water with our feet first. In other sections there are rope swings tied to tree branches at different heights, but this is no amateur set-up. There are various jumps that range from your standard rope swing to full-on carnival trapeze, none of which should be taken lightly. If jumping isn't your thing, floating down the river in an inflatable ring might be. How far? The dam is located in the Blue Mountains, close to Lithgow — about a two-hour drive from Sydney. The pool sits in an unassuming paddock about 15 kilometres south of Mount Gambier, looking a little lonely and out of place. It makes more sense when you learn that Baby Blue is a sinkhole, formed by the gradual collapse of an underground cave. The pool has an average depth of about 35 metres and it isn't unusual (but it is a little creepy) to see the odd diver suddenly emerge from below. 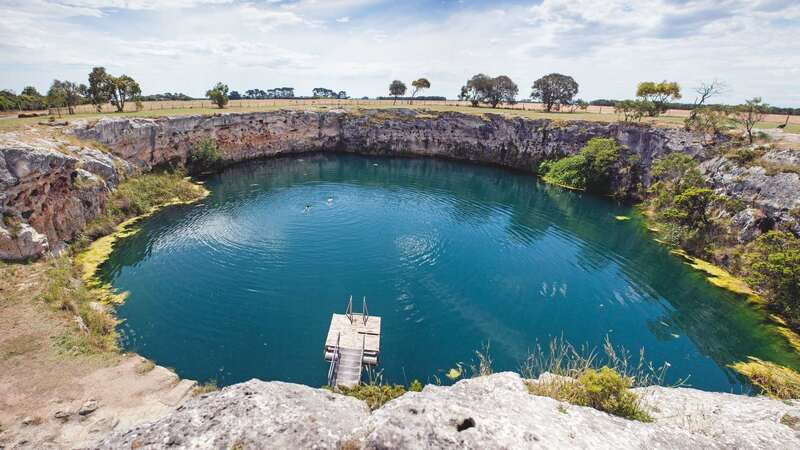 In fact, this area is one of the best inland diving destinations in the world, with a Swiss-cheese network of 500 underground caves and 50 sinkholes to explore. For our purposes, however, surface swimming is just about the right speed. Sheer 10-metre limestone walls make this an iconic South Australian jump and a rite of passage among locals. Like many places, signs forbid jumping here and there are murmurs of council-enforced fines, though nobody seems too concerned. Jump at your own discretion. Alternatively, take the steps down from the carpark side of the pool to a shiny new pontoon. This makes for a more gentle entry and is an easy introduction to the cool water. A few natural terraces extend back towards the road, providing a great vantage to sit and watch, like a swimming amphitheatre. How far? The lake is located just south of Mount Gambier — about a five-hour drive from both Melbourne and Adelaide. 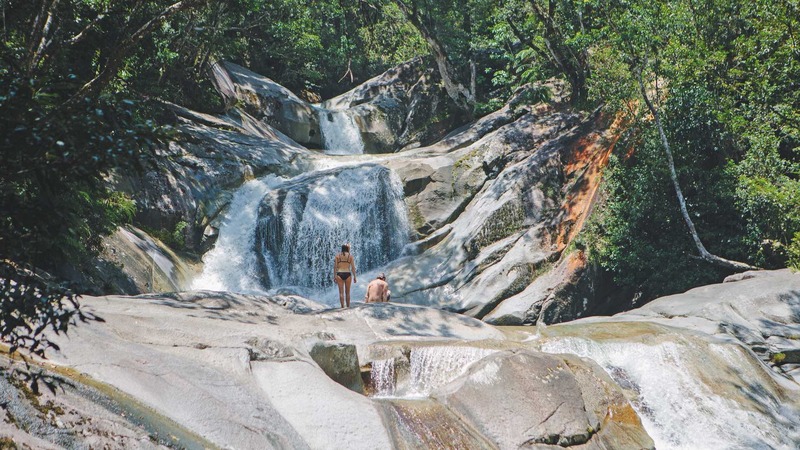 It could only be described as lust when we laid eyes on this series of tiered granite rock pools and waterfalls just south of Cairns in Wooroonooran National Park. This lush mountainous land, right on the coast, covers 75,000 hectares of the Bellenden Ker Range and forms part of the Wet Tropics World Heritage area. The range includes Mt Bartle Frere, Queensland's highest mountain (1622 metres). Josephine Falls sits at the base, with a constant flow from streams that cascade down the mountain, creating some of the cleanest waterways in the world. There are three spots to stop along this boardwalk. The first is where you get in to swim. We find people sitting and chatting in crystal clear shallow pools, while others laze on big boulders in the dappled light. 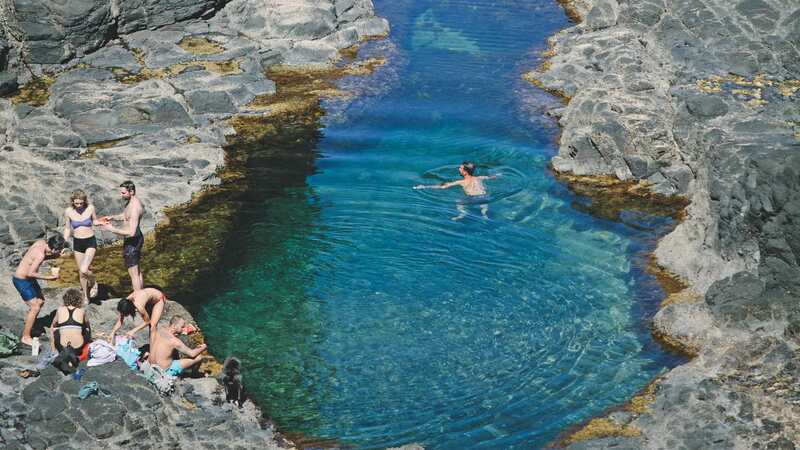 The biggest rock pool has a sandy bottom and is bordered by a giant piece of slippery granite that people are queueing up at to slide down, some wearing inflatable iced strawberry doughnuts. Scrambling further up takes you to more rocky slides into smaller pools, and families splashing about and fishing for yabbies. The second stop is a deck that looks over the rock pools onto swimmers below. Continuing along the rainforest walk takes you to the third stop, a large viewing platform looking up to a flowing waterfall with a deep plunge pool. It's probably the most impressive of them all but, unfortunately, is not open to public swimming. How far? The falls are located in Tropical North Queensland — about an hour south of Cairns. This basalt coastline is quite unlike anywhere else in the area, or even the state. Volcanic black rocks emerge from clear blue water. Deep pools are filled at high tide and slowly warm throughout the day. It has a distinct look and feel, so you can imagine how our eyes popped out of our heads when we saw this secret spot featured in the 2009 film adaptation of Where the Wild Things Are. Indeed, it seems like a natural place for a wild rumpus, and you will see lots of kangaroos if you arrive early in the morning. Don't be surprised to see waves exploding onto the beach, as it is exposed to a constant barrage of swells from the south. We prefer the safety and beauty of the nearby tidal rock pools. Follow the beach east towards the rocky headlands. The most prominent feature is Elephant Rock and the best pools are distributed around its base, on the left-hand side. Water is always clear here and often a few degrees warmer than the ocean – Victoria's version of a spa bath. Remember, this is a low-tide-only spot, so take a moment to make sure that rogue waves aren't crashing into the pools before jumping in. Otherwise you may suddenly find yourself inside a washing machine or heading out to sea. How far? 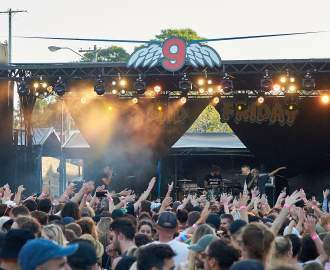 The bay is located on the Mornington Peninsula — about an hour and a half from Melbourne. The dramatic Emma Gorge falls pour over a 65-metre-high cliff into a large plunge pool, punctuating the end of the 1.6 kilometre hike in. The track begins at Emma Gorge Resort, and winds past the deep Turquoise Pool (also a great spot to swim, which we take note of for later) before arriving at the falls. The water is refreshingly cool, shaded by the looming cliffs for most of the day. Tourists dribble in and out, dropping piles of clothes on rocks as they stare up at the falls in awe before shocking their hot, sweaty bodies with the water's cool, pristine touch. The plunge pool is deep and wide with a rocky bottom, but the water is so clear and fresh, you could drink it. We bliss out for a few hours before making out way back along the track past Turquoise Pool, where we take another plunge. The surface water here is lit up by the sun, giving it the turquoise colours it's named for, while people gather at the fringes to cool off. A rock jump begs us to plunge from a height rather than scramble over a slippery entry. 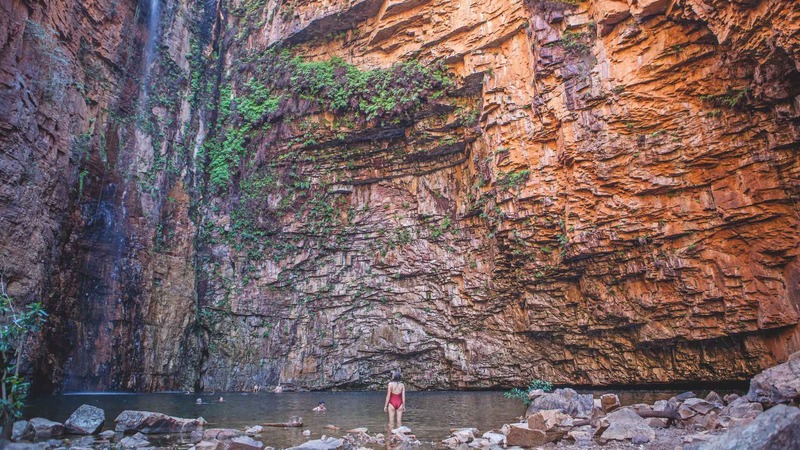 Emma Gorge is one of the most incredible places we've been, even late in the season when the water isn't flowing at its best. How far? The gorge is located just west of Kununurra — about half-way between Broome and Darwin. This is an edited extract from Places We Swim by Caroline Clements and Dillion Seitchick-Reardon, published by Hardie Grant Travel RRP $39.99 and is available online and in stores nationally.